Wendy joined Cushman & Wakefield Waterloo Region in 2015 as the Office Administrator, providing support services to the company’s agents and employees. 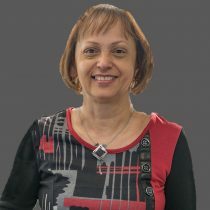 After graduating with a DEC in Data Processing from Dawson College, Montreal, Wendy worked for over 19 years in IT as a computer programmer/analyst for a large Insurance company, and was transferred to Kitchener, Ontario with the company in 1978. Wendy then spent 7 years abroad with an international bank as an IT Auditor, during which time she obtained her ISACA designation. After moving back to Stratford, Ontario, she worked in a residential real estate brokerage for over 8 years as an office/deals administrator before leaving in 2013 for a further 15 months abroad then returning to the Kitchener-Waterloo region and joining Cushman & Wakefield Waterloo. Outside of work, Wendy enjoys gardening, clogging, reading and spending time with family and friends.